For RM50/day, you can rent, drive, and earn! Introducing the Grab Rental Programme, the most affordable rental programme in town! With only RM50/day, you can drive a Perodua Bezza and enjoy amazing benefits that come with the programme. Why sign up with our affordable car rental programme? If you’re an existing Grab driver-partner and know of somebody who wants to join the programme, now’s the best time to refer them in! From 25 Feb – 24 March 2019, refer them up through the form below and you’ll get RM150* when they complete a minimum of 100 rides within the first TWO weeks since receiving their Rental car. *Terms and Conditions listed below. – You need to be an active driver-partner (complete 20 rides in the past month). – You may refer an existing Grab driver-partner. – Your referred driver-partner needs to use the sign-up form below. – Your referred driver-partner needs to select “Referred by Grab Driver” and key in your NRIC number in the form. – Your referred driver-partner has to go through the entire rental sign-up process and receive his/her rental car. – Your referred driver-partner needs to complete at least 100 rides within the first two weeks of the car collection. Interested to join? Fill up the info below and we’ll contact you soon! 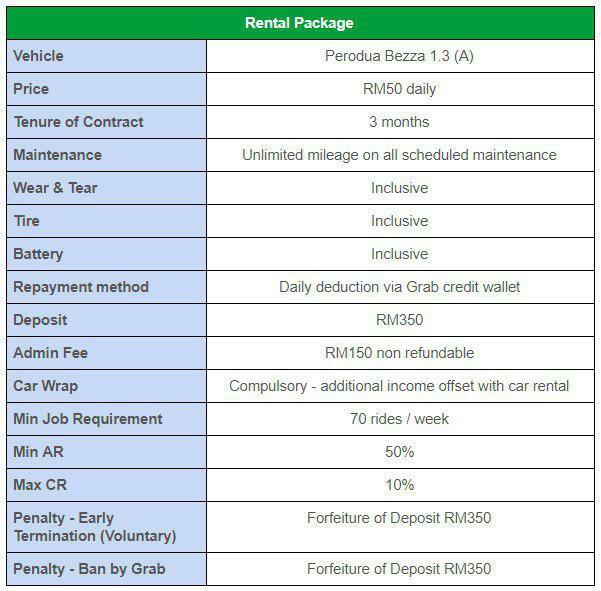 Who is eligible to join for the Grab Rental Programme? Malaysian citizen above 21 years old with full driving license. What are the application approval criterias? Application approval are subject to successful background and credit check. What is the time period of the rental contract? What is the mode of payment for the car rental? Car rental can be paid via Grab E-wallet. When will the car rental be deducted? Car rental will be auto-debit daily via Grab E-wallet. What happens if I opt out before the rental period ends? In case of early contract termination, deposit will be forfeited. Cost of major physical defects (exterior/interior), summons and outstanding rental will be charged accordingly. Can I drive this car to a different city for personal use? The maximum mileage that is allowed during the 3-month leasing is 50,000km. Should you exceed this mileage, the deposit will be forfeited to cover the repair/ maintenance cost.